Mar James Pazhayattil was born at Puthenchira on July 26th, 1934. After the matriculation at his native village he joined St. Mary's Minor Seminary at Thope, Thrissur in the year 1952. He had his Major Seminary studies in Kandy and Poona, and distinguished himself with high ranks at the Licentiate level both in Philosophy and Theology. He was ordained priest by His Eminence Valerian Cardinal Gracias on October 3rd 1961. Then he secured his master degree in English literature from St. Thomas College Thrissur. While he was working as a lecturer in the St. Thomas College and hostel warden in the same college he was nominated the first bishop of the new eparchy of Irinjalakuda on June 22, 1978. He received his Episcopal Ordination from His Eminence Joseph Cardinal Parecattil on September 10, 1978 at Irinjalakuda and took charge of the eparchy on the same day. From June 7, 1995 January 18, 1997, he was the Assistant to the Major Archbishop. At Present he is a substitute member in the permanent synod of the Syro-Malabar Major Archiepiscopal Church and chairman of the new commission for clergy and Institutes of Consecrated Life. 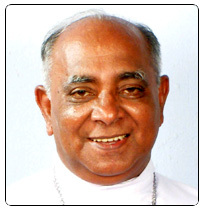 on reaching the age of 75 he tendered his resignation for office which became effective on 18 April 2010 when his successor Mar Pauly Kannookadan assumed office as the Bishop of Irinjalakuda.